Welcome to the 330 Register! The new 330 GT car embodies all the advanced characteristics of the true "Grand Touring" car. Its innovations along with its traditional values combine to make this luxurious and powerful car a realization of twenty years experience with the production of the 12-cylinder Ferrari Engine. When was the last time you saw a barn-find Ferrari? 330 GT 2+2 Series II S/N 7607, with black plates and 81,000 original miles came up for sale on ebay and sold 12/23/2009 for $68,100.00. There was an amazing 74 bids before the bidding was exhausted. 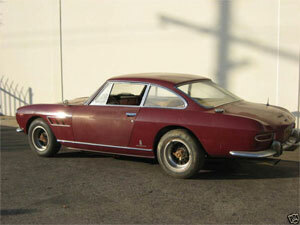 Originally delivered to Bagley in the USA, 638/PF (according to Hilary Raab's Ferrari Serial Numbers Part I, revised). Announcing, the availability to post 330 related car and parts classified ads. Please email for inclusion. Red with orig. Black leather and Red carpets. 70km. Pozzi Blue on Grey Leather. Cavallino and Prancing Horse Magazines for Sale. Copyright © 1991-2012 Ferrari 330 Register. ­ All Rights Reserved.